When travel plans require you to find care for your pet while you’re away, professional pet sitting services has many advantages over using a boarding facility. Whether you’re taking family vacations to destinations that don’t permit pets or traveling on business trips where your four-legged friend isn’t welcome, your furry family member will benefit from staying right at home with the care of a professional pet sitter. With doggy daycares, veterinary clinics and local kennels all available to house your dog or cat for anywhere from a few days to several weeks, pet parents have an assortment of options to choose from when it comes to finding a boarding facility nearby. However, despite their popularity among animal owners over the past several decades, boarding facilities simply can’t offer the same benefits as hiring pet sitting services whose employees will look after your animals in your very own home. Are you still not sure if you should board your pet in a facility or partner with a professional pet care provider like Ark Angels Pet Care while you travel this year? Read on to discover why you should skip the trip to the boarding facility and opt instead to receive the top-notch care that comes with pet care services that come to you. Less Stress in a Familiar Environment: Whether you travel frequently or this is the very first time you’ve left your animals in someone else’s care, your absence will likely create a stressful situation for your furry family members. Many pets suffer from separation anxiety, even if their owners are only away for a few hours or a few days. By packing up your pet and taking him to an unfamiliar boarding facility filled with strange sights, sounds and smells, you’re only adding to the level of stress he will experience. 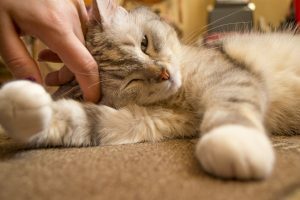 Allowing your pet to stay at home in his familiar surroundings and having pet sitting services send a sitter to your house a few times a day to provide food, water, a walk and some much-needed TLC is a much better option because it eliminates the stress and anxiety that accompany a stay in a strange place. Receiving Personal Attention and Playtime: The vast majority of boarding facilities consist of row after row of tiny kennels with metal sides and cold cement floors. And with the exception of occasional outside potty breaks and a few minutes of interaction with the kennel staff, when you opt to board your pet rather than enlisting the help of pet care services, your furry friend will spend all day and night confined to this small, unfriendly space. In-home pet sitting services, however, give you access to an animal-loving professional who will visit as many times as you would like each day and take the time to develop a unique bond with your pets. This one-on-one interaction, extended amount of playtime, and personal care and attention is something that your pet simply won’t receive anywhere else. No Exposure to Other Animals: Dogs and cats who are boarded in a crowded kennel facility that houses dozens of other pets during their stay are ultimately exposed to the potential of contracting diseases or parasites from other animals, regardless of how careful the kennel staff may be. Kennel cough—a canine respiratory infection caused by pathogens that attack the lining of the respiratory tract, causing inflammation of the upper airway—is an incredibly common issue found within boarding facilities. Because it can be contracted simply by breathing in the bacteria or virus particles from the air, your dog is at risk of catching kennel cough just by walking into a boarding facility. Hiring pet sitting services to care for your dog at home eliminates this risk of exposure to the various bacteria, viruses and parasites prevalent in facilities that house an abundance of animals. Developing a Relationship with your Sitter: When you drop your pet off at a boarding facility, you have no way of knowing which staff member will be interacting with your animals during potty breaks and feeding times, let alone who will be administering any medications your pets may require. When you hire Ark Angels Pet Care to provide pet sitting services, however, you will have the opportunity to meet your pet’s caregiver in person well before your planned travels. This in-home consultation with the individual who will provide pet care services for you serves as a way to familiarize your animals with the person who will be caring for them, and it also allows you to share any concerns you may have and get answers to all of your questions about the pet sitting process. Peace of Mind: Perhaps the most important benefit you will receive when you entrust local pet sitting services to care for your furry friends is the peace of mind that comes with knowing that they’re in the hands of a professional. Ark Angels Pet Care is insured, bonded and certified, and all pet sitters undergo background checks prior to hire, so you can rest assured that the person caring for your dog or cat is someone you can trust. If you don’t want to spend your entire vacation worrying about how your pets are doing and whether your home is safe and secure when you’re supposed to be relaxing, hire professional pet sitting services during your next trip away from home. Instead of shipping your four-legged family members off to a boarding facility that is responsible for looking after dozens of animals each day, opt for an in-home pet sitter who will send you photos and updates on how your animals are doing each time they visit your house to offer plenty of personal attention and TLC. An Experienced Person Capable of Handling Emergencies: As a devoted pet parent, the last thing you want to think about is the potential of an emergency occurring while you are away from your animals. But from illness to injury—and even problems with your property—a series of issues can arise during your absence, and you can’t put a price on knowing a reliable caregiver from local pet care services is available to properly handle any situation that occurs. When you conduct an in-home consultation with a professional pet sitter, you’ll fill out paperwork indicating everyone who should be contacted in the event of an emergency, so you won’t have to worry about your pet sitter trying to get in touch with you to find out how they should deal with any problems that take place. Plus, professionals who work for pet sitting services like Ark Angels Pet Care are typically trained in pet first aid and CPR, which allows you to relax and actually enjoy your trip with the confidence that an experienced professional who is capable of maintaining control in an emergency is the one responsible for looking after your beloved pets when you’re gone. If you want to ensure your four-legged family members are receiving the best possible care when your travels take you away from home this year, forget the trip to a crowded boarding facility or kennel that will only result in increased stress and anxiety for both you and your pets. Instead, contact Ark Angels Pet Care today to find out how professional pet sitting services can provide you with peace of mind and provide your pets with plenty of fun, love and attention when you travel!